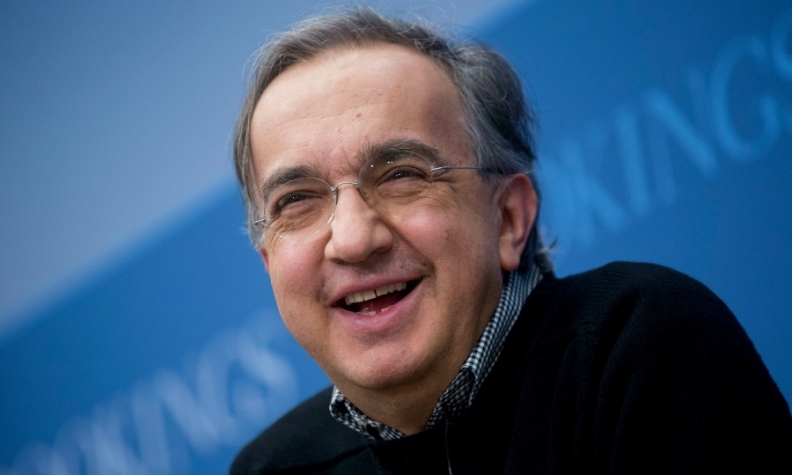 Marchionne, 65, is set to start his final year as FCA CEO. MILAN/DETROIT -- Sergio Marchionne spent the last 14 years transforming Fiat Chrysler Automobiles through a series of spinoffs and mergers from a near-bankrupt Italian conglomerate into a top-performing automaker. His pending exit may open the door for the next big deal. Marchionne, 65, is set to start his final year as CEO after Fiat Chrysler's annual shareholders meeting on Friday in Amsterdam. His plans to hand over to one of his aides has long been flagged, but what happens beyond that is a mystery. The automaker, referred to as FCA by investors, isn't going to provide much insight before presenting its plans for the post-Marchionne era at a June investor meeting, stoking speculation. "This is clearly the end of an era and maybe more, as Marchionne is not just the mastermind behind FCA, he is FCA," said Giuseppe Berta, a professor at Bocconi University and former head of Fiat's archives. "After he is gone, FCA will have to change, and this opens room for a big transformational deal." While Fiat has become competitive thanks to Marchionne's maneuvering -- crowned by the 2014 combination with Chrysler -- it still lags global giants Volkswagen Group and Toyota Motor. Size matters in the mass-market auto industry amid pressure to make massive investment in autonomous driving and electric vehicles, and a deal could be in the interest of the Agnelli family, the Italian industrial clan that controls Fiat and has been diversifying away from the volatile car industry. For his part, Marchionne -- a vocal proponent of consolidation -- is looking to make the company an attractive partner, even if he said in a January interview that FCA is now strong enough to survive on its own. His last big goal is to eliminate 2.39 billion euros ($2.96 billion) in net industrial debt by June, when he plans to unveil the automaker's strategy to 2022. To celebrate the debt milestone, Marchionne has said he would wear a tie instead of his trademark sweater at the June investors meeting, which will take place at the company's Balocco test track near Turin, the same place where he presented his survival plan for Fiat in 2004. Here's a look at the top three deal scenarios for the owner of the Jeep, Alfa Romeo and Dodge brands, based on discussions with Fiat analysts and investors. The company declined to comment on its future strategy. After General Motors rebuffed Fiat's merger approach three years ago, declining U.S. vehicle sales and President Donald Trump's "America First" policies could revive chances of a deal with a U.S. counterpart. Ford Motor is now seen as the better fit. Both companies have family owners and can exploit synergies in high-volume platforms like pickup trucks. "Ford is clearly the deal that makes the most sense," said Adam Wyden, founder of ADW Capital. "Ford is struggling and needs to revamp its strategy," while Fiat is "in a position of strength." A deal between Fiat and Volkswagen has long been speculated and would give the German auto giant instant credibility in the U.S., where it has struggled for years, and deliver a new profit source in the Ram truck business. But a deal could come too soon with VW still working through its diesel scandal and a management overhaul in the works. Another European alternative would be a combination with PSA Group, Europe's second-largest automaker after buying GM's Opel business last year. While a stronger presence in Europe -- where Fiat is No. 4 -- wouldn't solve the Italian-American manufacturer's issues in Asia, it would help balance out the U.S. business. "The trade war we are seeing shows that there is a growing trend for regional champions," said Vincenzo Longo, a strategist at IG Market. "In this context, I see a European deal more likely." Volkswagen declined to comment. A PSA spokesman referred to CEO Carlos Tavares's comments last week that further consolidation in Europe wasn't possible because of antitrust rules. As Chinese automakers extend their influence, Fiat Chrysler stands to be an attractive opportunity to acquire a coveted stable of brands, especially Jeep. Zhejiang Geely Holding Group, which owns Volvo Cars, held informal talks about the potential takeover of the company before the Chinese manufacturer's billionaire founder turned his attention to Mercedes-Benz parent Daimler, people familiar with the matter said in February. Marchionne said at the Geneva auto show in March that he sees the interest from Chinese automakers as "obvious" and that he would not oppose a Chinese investor even if it could be politically unpopular in Italy and the U.S.
A Geely spokesman declined to comment. Other Asian automakers offer remote partner potential, and then there's the outside chance that Marchionne, who said in January he's "tired" of the grind of being a multinational CEO, comes back at the request of the Agnelli family to steer the company after a deal. "We see the possibility that, after leaving though the front door, Marchionne could come back through the window as the 'maestro' of a bigger group," said Emanuele Vizzini, who manages a $4 billion share fund at Investori.